Tigers are an endangered species. Find out more about these carnivores, how they live, hunt and nurture their cubs. Enjoy the wide range of interesting tiger facts. Tigers are carnivores. They eat pigs, deer, rhinoceroses, and even small elephants. The scientific name for the tiger is Panthera tigris. Tiger researches think there may only be 3,500 tigers left in the world. Tigers live on the continent of Asia in grasslands, forest and swamps. 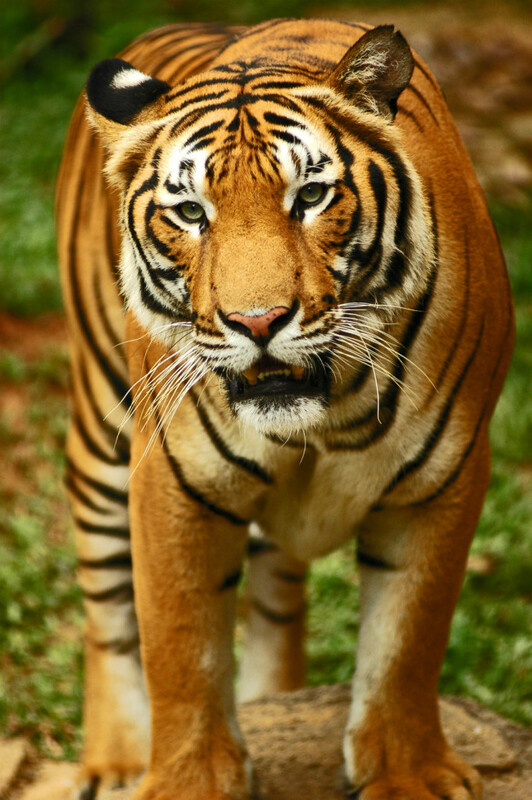 There are five subspecies of tiger: Bengal, South China, Indochinese, Sumatran, and Siberian. A tiger can live to be 26 years old, of course in captivity. The life span of tigers in the wild is thought to be about 10 years. Tigers weighs up to 720 pounds (363 kilograms), stretches 6 feet (2 meters) long, and has a 3 foot (1 meter) long tail. Tigers consume about 12 pounds (5 kilograms) during a meal. Tigers love water and can swim up to 6 kilometers. A female tiger may have from one to six cubs in a litter. Tiger cubs are born blind and weigh only about 2 to 3 pounds (1 kg), they live on milk for 6-8 weeks. The tiger cubs generally stay with their mothers until they’re at least two years old. A tiger’s paw prints are called pug marks. Tigers mark their territories by spraying bushes and trees with a special mixture of urine. Check out some interesting facts about lions!